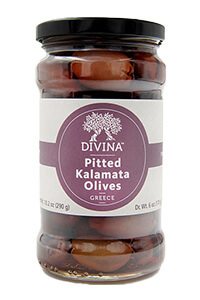 These pitted gourmet Kalamata olives are easy to use in classic dishes such as pizzas, pasta, sauces and Greek salads or in combination with other appetizers like cheese and meats. The world-class Greek Kalamata olives are bursting with flavor. Known for their firm a texture, a smoky taste these olives are hand picked at peak ripeness. Ingredients:kalamata olives, water, red wine vinegar, sea salt, grape must.